It is virtually impossible to be a car driver and manage to stay off the highways of the nation. If you do travel on highways, you have to be aware of semi trucks because they are pretty much everywhere, transporting goods to and from market or doing whatever they need to do to keep the economy going. If you ever notice the names of the truck manufacturers, you will almost always see the name MACK emblazoned on them - they are by far one of the most recognizable names in transportation, but they weren't always called Mack. In fact, in the early days, the Mack brothers (there were five of them) were part of a group of vehicle producers called the International Motor Company. 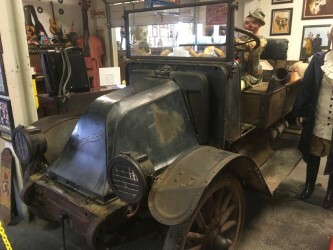 The IMC truck we have on display at the Treasure Tour is from 1917 - it just celebrated its centennial birthday last year! Come out and visit it. Maybe bring it a birthday cake (it likes pudding cake).